Alessandro (Alessandro Gazale) is a local events singer, whose carrier never took of anywhere. Quite often you’ll find him at the bar just downing alcoholic drinks and playing slot machines. Only later on in the story, the viewer gets the full picture of what kinds of person is Alessandro, what his past was life and what it has become. He is not as successful as he hoped to be, money is a constant struggle and it doesn’t look like it will end soon. However, even after thirty years without success, he still has a love for what he does and continues doing it. Combination of his age, his life situation and alcoholism quite often leads to anger issues, but Even though the protagonist might be quite aggressive when he had a few drinks too many, you will still find yourself empathizing with him. Alessandro’s life shifts its directions when he meets Francesca (Francesca Niedda), a single mother trying to find a way to be with her son. Alessandro tries to help Francesca, even though her character is hard to judge throughout the whole movie. Not only viewers but also the protagonist himself does not seem too sure what to actually think of her. The story gives very little information about Francesca, which at times might make to trust her fully, however, her current fight for her son allows to emphasize and ruth for her success. Director Bonifacio Angius opens a bit of a taboo topic and at the same time never really reveals what kind of issues does Francesca have, leaving for the viewing to do it’s judging… or not. There’s a feeling that there are no non-purposely introduced characters; every single one of them plays a relevant role and has an impact on the story. 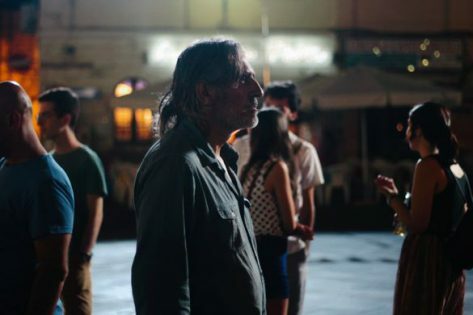 Movie Wherever You Are (Ovunque proteggimi), was part of the Cinema Made in Italy 2019 festival. Together with the screening of the movie, there was a Q&A with the director. Interview with the director will come shortly, for now, enjoy the trailer of the movie!